Harley-Davidson® Men's Silencer Sunglasses has an iconic Harley-Davidson® script on both temples. 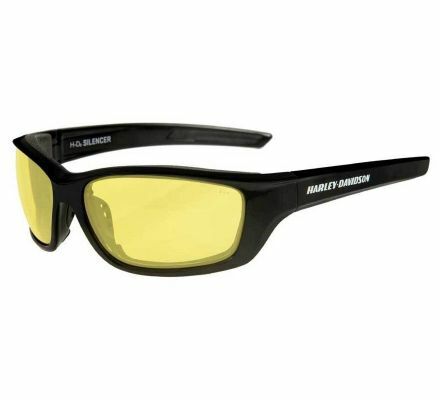 This eyewear meets ANSI Z87 high velocity impact and high mass impact requirements. Soft fixed foam Facial Cavity Seals, locks onto lightweight frames to help protect your eyes from wind and debris. Hard coating, scratch resistant coating eliminates distracting reflections of the lens surface. Anti-fog coating prevents misting on the lens in high humidity and temperature differences. Yellow Lenses: Best light enhancing lens tint. Enhances contrast in low to extremely low light conditions.